In his latest article / report found on RMN under the following link (see below), Fulford states, quote "The thing where I do know, said Fulford, that I have a concrete marker for, is that, I have been given bonds that were given to the daughter of the last emperor. 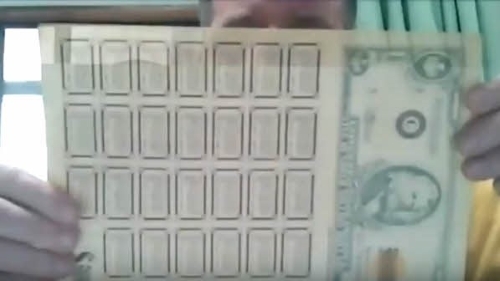 (And Fulford shows one of the bond sheets worth $1.16 billion US dollars and that he has 200 of them - on camera in the Prepare For Change video interview dated Nov. 15, 2018.) The US bonds are confirmed to be real by two sources. We caught him out once before when he publicly stated in an article that he held a number of boxes of Bonds. Then he back tracked and stated that he didn't actually have the boxes in his possession but they were promised to him if he could do anything with them. This time we are not going to accept his follow up Bulls*** because it is quite clear that he has the bonds in his possession because he also states, quote "And Fulford shows one of the bond sheets worth $1.16 billion US dollars and that he has 200 of them - on camera in the Prepare For Change video interview dated Nov. 15, 2018". If you don't have them Fulford, then you cannot display them. You are, without any doubt whatsoever in unlawful possession, whether permanently or temporarily, of stolen property, handling stolen property and attempting to use said stolen property for unauthorised purposes and fraudulent purposes. Then he states, quote "The bonds are going to be cashed by the US treasury ...... ". The US Treasury are not authorised to cash any of the Bonds you are referring to, without the express legal consent of the ITC as legal Heir and Owner of the GDF. The fact that these Bonds are legally owned by the Global Debt Facility (GDF) makes the US Treasury complicit with you in your crimes against the legal owner, and crimes of a criminal nature under International Law and our "Sovereign" laws, because neither you or the US Treasury have or hold any authority from the ITC to undertake anything with these Bonds. The Bonds you are displaying within your article are yet another batch of Bonds similar to those confiscated in Switzerland on the Chaisso border with Italy, being carried in a false compartment of Yamaguchi's briefcase. Yamaguchi and Watanabe were sentenced to 3½ years in prison, in their absence as they had jumped bail and returned to Japan . Whether you like it or not, or are prepared for it or not, legal action will be taken against you within our Court System, which is an independent court of International Jurisdiction under the "Sovereignty" of The International Treasury Controller who, under International Treaty, is the Legal Heir and Owner of said Bonds because they are listed as assets of the GDF and the GDF is legally owned by The International Treasury Controller. Therefore Fulford, don't go missing because we will find you and you will pay for your crimes along with the US Treasury. Stealing is the only way some people can survive because they overstate their own abilities and then fail, in some cases quite dramatically. Fulford is no different, neither is / are any person / persons who steal from the GDF for their own financial gratification, or public recognition. I personally am surprised you have admitted your possession of stolen property, handling stolen property, money laundering and wire fraud, because your articles are mostly made up of lies and deliberate distortion of the truth. I don't know why you don't approach the ITC and be honest about it all of this, rather than the deception you have used past and present. You would not be prosecuted if you were honest, but I suppose with you that is asking far too much. Finally, I will repeat myself for about the hundredth time:-- All Assets and Accounts listed and recorded under the Global Debt Facility (Foundation Divine and Heritage International Trust, or any derivative of same, whether a Trust, Foundation, Corporation, Institution, supplementary or illicit bank accounts, or similar, situated in any country of the world) as otherwise known as The Combined International Collateral Accounts of the Global Debt Facility, or simply the Collateral Accounts, are the Legal Property of The Global Debt Facility, which is by Legal International Treaty executed by the Royal Families of the World and the Allied Nations of G7 Nations of the World, the legal property of the Successor Heir, The International Treasury Controller, and are legally registered as being held on behalf of the World and its People by The Central Bank of the International Treasury, and administered and managed by The International Treasury Controller who under the aforesaid International Treaty (ies) such Assets and Accounts are at the sole disposition and discretion of The International Treasury Controller at all times and for all purposes and for the benefit of every Nation on this Planet and all of its people. Fulford, and all others who seem to ignore INTERNATIONAL FACT and LEGALITIES, those certificates you now claim to have in your possession and have displayed within your latest article, are the Legal Property of the Global Debt Facility, under the sole disposition and discretion of The International Treasury Controller. WHAT PART OF THE AFOREMENTIONED STATEMENT OF FACT, ENCOMPASSED IN LAW, IS IT THAT YOU DO NOT UNDERSTAND ????? The reason I ask the question is because The International Treasury Controller, being the Legal Heir of Succession, and Legal Owner, a "Sovereign" with its own "Legal Jurisdiction", has enacted Laws whereby any breach of the above statement / law is considered, in compliance with our laws, as a Criminal and Treasonous act of Theft and Fraud against the People of this world for which the penalty is Death by Firing Squad, which applies to both / all of those directly or indirectly involved with such Theft and Fraud. You are now / and have been advised, publicly, yet again, as have all others, of the consequences of your, or any criminal activities. So please do not even think that the consequences are nothing and are unenforceable. We do not operate as you and others do ---- in a criminal manner. We make sure that what we do at all times is Legal and above question or dispute and in full compliance with International Treaties and our Mandate. i). All Codes, whether Account Access Codes or Individual Codes issued to Custodians, Trustees, or Foundation Managers, previously organised and issued by Ferdinand E. Marcos, the defunct TTTGC or the Federal Reserve, or any other group, organisation, institution, are, as of the Ist July 2012, legally declared Revoked, Nullified and unenforceable. This is to prevent continuous fraudulent activities against the Combined International Collateral Accounts of the Global Debt Facility, by any person, party, company or corporation, Government, Government Authority, Trust, Foundation, Trustees, Foundation Managers, or otherwise. New Codes will be issued ONLY by The International Treasury Controller as Legal Heir, Owner, and Sole Arbiter of the Combined International Collateral Accounts of the Global Debt Facility. No other person, party, Bank (Central Bank or otherwise), Government, Government Authority, Custodian, Trustee, Foundation Manager, Organisation, or otherwise hold any legal right or power in International Law, or under any of the International Treaties, to issue any Codes whatsoever. Reference: The new "Sovereign Court" of Common Law and international Jurisdiction shall mean a Court (Both Criminal and Civil) under the "Sovereign" status and Jurisdiction of The International Treasury Controller which will be responsible for hearing and adjudicating cases against any person, party or otherwise (as defined above) accused of any criminal act or acts against The Combined International Collateral Accounts of the Global Debt Facility. Such Court shall operate within any suitable country as determined by The International Treasury Controller, and shall be subject to the full consent and approval of the Government of such countries chosen by The International Treasury Controller. Note: In compliance with International Treaties, no other Court, either Nationally or Internationally, including the ICJ and ICC hold any Jurisdiction whatsoever over The Global Debt Facility, The International Treasury Controller, The International Treasury Control, its Staff / Employees, its Operations, any Assets / Accounts officially listed and recorded as being under the legal ownership and property of The Global Debt Facility, otherwise known as The Collateral Accounts, or, The Combined International Collateral Accounts of the Global Debt Facility. Is this woman suffering from long term dementure, psychological disorder, or is she just another American living continuously on fantasy Island? Because this time you have completely out done yourself with this absolute psychological rubbish of yours. To say that the Gold in the Philippines all belongs to America and was deposited in the Philippines by America to hide it from the bankruptcy proceedings against America as a country, whereby the Philippines is the Trustee on behalf of America, is the most blatant and dastardly lie, mistruthful, disinformation, and fantasy I have ever heard. This woman, who claims she is a lawyer, when she apparently isn't, unless she is referring to her position with some obscure and highly questionable organisation in Alaska; hasn't a clue about the truth, historical facts, or historical documentation (which she does not have in her possession) yet spews out her garbage hoping that some will believe it, about America owning all the Gold in the Philippines. What is she trying to do? Is she trying to justify the Theft of Gold and other assets from the Philippines by over 3,500 American Mercenaries, the American Navy and Air force, in conjunction with the US Deep State / cabal? Gold that is for the benefit of all countries and people of the world and was stated within FEM's Official Last Will and Testament; as being "The Holy Wealth of our Holy Father in Heaven" by former President of the Philippines, Ferdinand Marcos, former M1, Master Holder and Descendant of the Chinese Qing Dynasty, who, with a lotta help from the CIA, ousted Ferdinand Marcos in the 1986 Edsa Revolution. Said Gold and other assets are now under legal ownership and management of the appointee, made under International Treaty (which America, as well as representatives of the WB, IMF, FATF, ICJ, ICC, and others, executed in 2012) of the 3rd Successor Heir and Sovereign", The International Treasury Controller. Period, no other explanations needed because it is all written into law and fully registered at the UN and fully understood by many nations around the world who now realise how they were duped by American lies and deception many years ago, and for which those countries are legally and financially liable and responsible for the safety and security of said Gold and other Assets deposited (actually secreted under International Treaty 1920, by the Japanese under the orders of Emperor Hirohito of Japan) held within their country, or country's borders. As for Sterling Seagrave's book, the information contained in that book came from one source ...... Imelda Marcos who was NOT, in law, Marcos's wife and is a CIA asset. She became a CIA asset after executing an agreement with the CIA in Hawaii, allowing her to be released from House Arrest and returned to the Philippines to carry on with her duties as dictated by the CIA. She wasn't even at FEM's bedside, in Hawaii, when he died, yet spilled "Crocodile tears" at his funeral in the Philippines. Another hypocrite whose quest for power and money coupled with lies and deceit is unquestionable. Please Anna von Reitz, go back into your little corner, crawl into that hole you have made for yourself, and stop writing rubbish (FAKE INFORMATION) about a subject you have very little, if any, knowledge about. You are way out of line on this matter. Stop stirring up mis-beliefs, lies and deception for your own (or the ones supporting you) gratification. If you can't write anything that is truthful and factual, then don't write at all because you really do embarrass yourself, and those behind (supporting you) in front of the whole world. Write Children's novels, or follow J.Rowling in writing totally fictional stories, which based upon your many articles, you are good at and can make lots of Money, money, money, if that is your intent, or certainty end up a "Deep State" hero. In a way, I can't help feeling enormously sorry and pitiful for you, a lost soul who seeks recognition from the masses. Get a life Anna, get a life, and stop writing your completely eccentric and mentally irresponsible garbage.